A new review of Re-Animator the Musical has hit the Web and it's a lovingly crafted (see what I did there?) love letter of Lovecraftian proportions that lauds the production in almost every conceivable way, which problems means you should go see it. Their bottom line assessment is that it's a "Brilliant reanimation of classic horror film completely realized for an entirely different medium. Superbly performed and perfectly calibrated for the imaginative space where audience and spectacle." 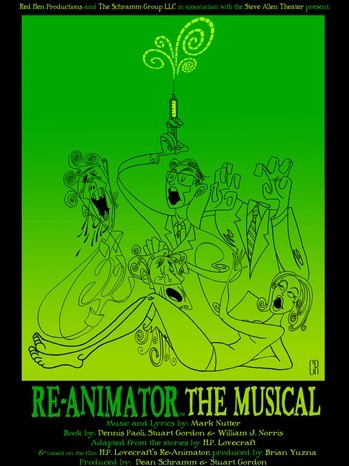 Mad plot has med student Herbert West (Graham Skipper) concocting a serum that shocks the brains of the recently dead to a state of “re-animation”. Beleaguered by an academically dishonest professor (Jesse Merlin), West’s work lends itself to misunderstanding. When he persuades his roommate Dr. Dan Cain (Chris L. McKenna) of its surpassing value by experimenting on his pet cat, Cain becomes his ally, but the latter's girlfriend Megan (Rachel Avery), the dean’s daughter who won’t move in until they are married, doesn’t share his enthusiasm. Mayhem ensues. The show is running at the Steve Allen Theater in Los Angeles though May 29. Looking for the best replica watches observe winder is apparently any difficult process, specifically with all the wide selection regarding observe winders supplying out there. Regardless of with the web more and more alternatives of varied breitling replica brand names, the lookup of your rolex replica uk observe winder must give attention to the product quality, compatibility, trustworthiness with the winder brand names, not merely according to value rolex replica on your own. All things considered, you might have put in a large amount of funds on your own great breitling replica uk observe assortment. Present day manufacturer programmed timepieces range between a couple of a huge selection of money to a few hundreds money or maybe more.